PPC Management on What's the bigger social media idea: marketing stimulus or business process innnovation? jacky on Tell 3000! My Book Just Launched! Keep Listening, Stay Credible! 9/03 "Pull the Plug on Pop-Ups"
5/03 "Spam Issue Is Our Fight"
3/00 "Woo Skeptical Consumers With Increased Respect"
First jump out of the gate on publishing, and a thrill beyond thrill to have this opportunity. Very important message about what it really takes to manage a business or brand in the era of consumer control. This book is far less about social media marketing campaigns than the role of customer service and "consumer affairs" in the marketing mix. More important validation about the role of CGM and social media as it impacts business. Both writers very smart and experiences in the space. Will write more once I get through the entire book. A major inspiration for much of my thinking about CGM. Heskett's a former b-school professor. Election Day: As the Blogs See It! 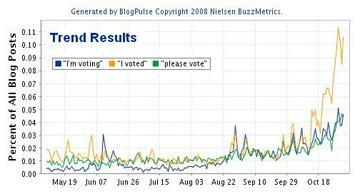 Overall Election Buzz Swings: Here's the general breakout of blog conversations as they pertain to today's election. 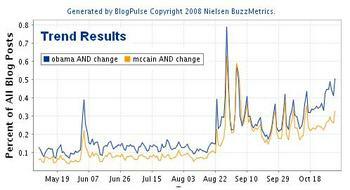 Note the swings over time between Barack Obama and John McCain. Another good indicator to check out is the number of times bloggers (including media bloggers) have explicitly linked to the candidates' websites since November 2nd. Here are the links for for Obama and McCain. "I Voted" - More Persuasive than "Please Vote"? What's unique so far about this election versus the last one is the degree to which folks have already voted, and are saying so explicitly online -- e.g. "I Voted" -- even with greater velocity than terms like "please vote" or "I'm voting." Will this build more momentum, or drive a bit of peer-to-peer pressure among those who have yet to hit their voting precinct? We'll see. Living in Ohio, it's clear just by driving by the downtown registrar office that thousands of people have voted ahead of time. The line last Saturday lasted hours, many said. 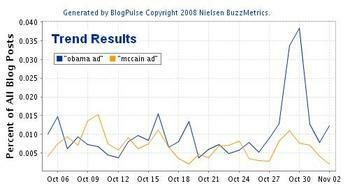 Who's Talking About the Ads: Here's a breakout of explicit "ad" reference for McCain and Obama. 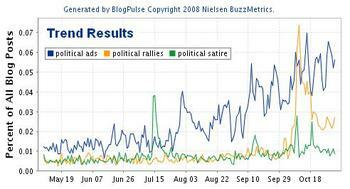 Not a huge number of references overall, but a deeper dive provides useful texture into the recall drivers or points of controversy (or acrimony) around the ads. The "Changing" Vernacular: "Change" has been one of the biggest buzzwords of the campaign, and both candidates have consistently woven it into their messaging. Here's the latest breakout on explicit references to the word "change" and the respective candidates. Forget the election results for a quick moment. What continues to capture my fascination is the degree to which all the campaigns are reaching out to key stakeholders in a participatory, respectful, personalized, and timely manner -- and attempting to shape my perceptions well before I read the first piece of online or offline news. Not all of this makes sense for big brands, but much of it does. Sample the late night messaging. It's a pretty incredible feeling, isn't it? After our victory in Ohio tonight we have the momentum, thanks to your will, determination, and hard work. And you know what they say, as Ohio goes, so goes the nation. Some people were ready to count us out. But you and I proved them wrong, just as we have every time they tried to declare this race over prematurely. And we're going to keep showing them exactly what we can do. We're going to do it for everyone across America who's been counted out -- but refused to be knocked out. For everyone who's stumbled -- but stood right back up. And for everyone who works hard -- but never gives up. Thank you so much, Ohio, for everything you did to make this night possible. We may not know the final outcome of today's voting until morning, but the results so far make one thing clear. When the dust settles from today's contests, we will maintain our substantial lead in delegates. And thanks to millions of people standing for change, we will keep adding delegates and capture the Democratic nomination. We knew from the day we began this journey that the road would be long. And we knew what we were up against. We knew that the closer we got to the change we seek, the more we'd see of the politics we're trying to end -- the attacks and distortions that try to distract us from the issues that matter to people's lives, the stunts and the tactics that ask us to fear instead of hope. But this time -- this year -- it will not work. The challenges are too great. The stakes are too high. Americans need real change. In the coming weeks, we will begin a great debate about the future of this country with a man who has served it bravely and loves it dearly. And we will offer two very different visions of the America we see in the twenty-first century. John McCain has already dismissed our call for change as eloquent but empty. But he should know that it's a call that did not begin with my words. It's the resounding call from every corner of this country, from first-time voters and lifelong cynics, from Democrats and Republicans alike. And so the campaign beat goes on! Win on the home (page) front. Both candidates do an excellent job providing enough well-organized content and "click to engage" choices to maximize relevance to as many visitors as possible. Even if you visit for half-a-second, you get a great feel for the things you can do on your second visit. This is important because most brands make consumers zip through multiple levels to get to what they need. Engage, enroll, and participate. Unlike most Super Bowl advertisers, candidates are constantly teeing up "things to do." 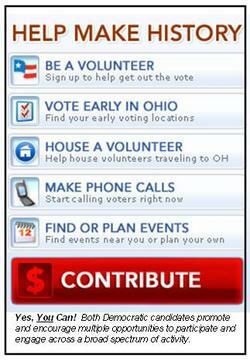 Barack and Hillary both have similar home page utilities to "Be a Volunteer," "Vote Early in Ohio," "House a Volunteer," "Make Phone Calls" or "Find and Plan Events." This, my friends, is what's known as engagement and when millions of consumers are engaging at some level, you know it can work. Roll up the TV set. The political campaigns exploit TV wherever they can go, and if your consumers can get it customized, oon-demand, or tailored to specific needs or constituencies on their Web sites via video, so be it. Video persuades, and connects emotionally. Both Clinton and Obama do a superb just exploiting the power of online video on their Web sites, and this has evolved nicely in the past six months or so. They are also both getting much better and making video embeddable and sharable, and they use to power of cross-promotion to power videos hosted on YouTube such as Obama's five million views -- an growing -- "Yes We Can." Hablamos con todas audiencias. While most automated teller machines open their first interaction with consumers with question about English or Spanish preference, most big brands give this short shrift. "That's not the focus of our interactive strategy," they'll say. The candidates, by contrast, are doing a great job teeing up parallel content in Spanish, and it doesn't take Bill Richardson to explain why this is important. Both candidates have very strong Spanish language sites, and they've done a commendable job developing tailored content. Blog links also suggest key influencers are paying attention. Both sites also do a nice job appealing to the "long tail" of audiences out there, whether by state, ethnicity, unique need (e.g. hearing impaired) and they do this without the core site looking too all over the place. Win with emotion. Obama's site does a brilliant job playing consumer emotion -- even more so than Hillary's. I'm not sure if it amounts to what Chris Matthews described as a "thrill going up my leg," but close. In particular, the use of video during and after the contribution process is very effective, and it almost makes you feel like there's the "emotional wind" behind your back in the giving process. Hillary's site is a bit more functional and operational, but also scores points here and there on emotion. Make it simple; make it friendly. I still marvel at the impenetrable unfriendliness of typical brand feedback or survey forms. Obama and Clinton are hardly perfect here, but they at least make their forms feel inviting. Oh, and I don't feel rushed, or forced to write it down in 50 letters before the software caves in on me. It's like the folks who designed the forms have felt the pain and anger over rude employees, lame call-center scripts, and more. Reinforce the loyalty immediately. Both Clinton and Obama appear to have solid relationship marketing tools in place to respond immediately to feedback or financial contributions. Both are customized but I give the edge to Obama on personalization and including yet another call-to-action in the follow-up. In my follow-up e-mail, it just felt more personal. Hillary encourages pass-along (e.g. "Click here to send an email to friends and family). Customize the loyalty. The Obama campaign goes well beyind reinforcing the loyalty to customizing the loyalty by encouraging people who sign up or give contributions to create their own mini-portal or blog platform via mybarackobama.com. You can blog, check your Barack points, build a profile and more. In some respects, this amounts to user-controlled panel management. Hillary allows users to create their own "groups" but the Obama campaign in on to something in driving deeper, more involved action at the what I call the "Ex-Spot." Share the assets. Both campaigns do a nice job empowering enthusiasts to share "official" content in their own content areas. Obama has a robust and comprehensive download areas for everything from Buddy icons to button designs, while Hillary's campaign offers a host of assets to share, embed, and beyond. Key lesson here: If you want to drive buzz, provide currency. Great use of home spun humor to get the point across. Great use of ironic juxtaposition? Why can't we create a voting system that's as simple as ordering a latte at Starbucks? Great example of a destabilizing question you'd only get through a format like this, to wit: "Would you work for minimum wage?" The wonder of CGM is that it can blossom from any place, any location, any source? Here's an onsite question related to the situation in Darfur. Part of what makes CGM so compelling is its sense of authenticity. Does anyone doubt this person's story? 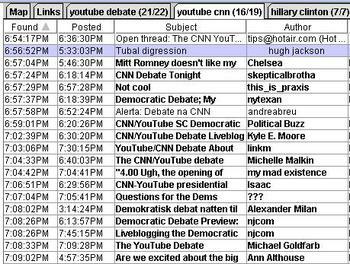 Here I am watching the CNN/YouTube presidential debate on our home TV while a stream of real-time blog entries gush out in front my laptop. The conversation is truly alive, and it's a truly fascinating real-time experience. Here's a sample of the debate flow. Thomas "World is Flat" Friedman declares a new motto for the future in this morning's New York Times magazine cover story: "Green is the new red, white, and blue." But far from suggesting Americans are anywhere near measuring up to oft repeated claim of being "the greenest generation," he suggests, quite persuasively, that "we have not even begun to be serious about the costs, the effort and the scale of change that will be required to shift our country, and eventually the world, to a largely emissions-free energy infrastructure over the next 50 years." His article ("The Power of Green") proceeds to lay out a persuasive argument -- nay, a manifesto -- that going green is at the heart of America's future competitive advantage and geo-political long-term interests. The article is a highly provocative read, and I'll bet the (organic) farm that by years end, it will rank in the top ten articles cited in online conversation related to sustainability and other green themes. That's what good memes do, and in this case we have a bonafide green-meme. The Broader Conversation: I've always been fascinated with this topic, and my original introduction into the blogosphere was precipitated by the purchase of my hybrid car, which I chronicled with both evangelism and skepticism starting in 2004 via HybridBuzz.com. But my own personal CGM is but a spec of dust in a broader universe of conversation erupting across the web related to green or environmental themes. What was once the limited domain of the crunchy-set has pushed the conversational boundaries to new audiences, new recruits, new spokespersons, and of course powerful new green memes. Even at work, the green topic is near impossible to ignore, as one of our top new initiatives at Nielsen BuzzMetrics revolves around measuring conversation related to "sustainability," which ever-reliable Wikipedia defines as "is an attempt to provide the best outcomes for the human and natural environments both now and into the indefinite future." It's hard to ignore because customers have come a knockin' on the door on the topic. Is this the next consumer attitudes tipping point? Is now the time to go organic? Is there competitive advantage in jumping ahead of the curve...or liability in waiting on the sidelines? Such are the questions of the new business era. 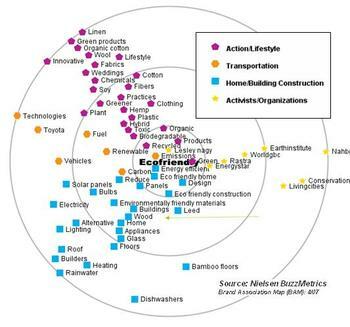 More Bammage - Eco Friendly Associations: Our sustainability team has been running a host of fascinating analysis on current "green" conversation levels, especially via the same Brand Association Map (BAM) technology I shared last week in the context of American Idol contender (and buzz builder) Sanjaya. In this particular case (see large circular graph), we're looking at the "DNA" of tens of thousands of online conversations surrounding the term "eco-friendly." 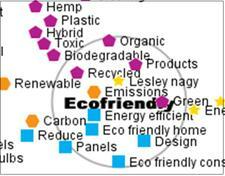 Eco-Friendly is quickly emerging as an "equity" with which many brands see value in association. You'll note that only a few companies such as Toyota (full disclosure: a client...recall my "Green toilet" post) surround this particular grid, but you can quickly vet out a host of lifestyles and behaviors that surround the term. In the category labeled "Home Building/Construction," for example, you can assess points on the grid that reflect tangible conservation opportunities (e.g. solar panels, bamboo floors). If you look right smack at the center of the grid, you'll see the name Lesley Nagy. Turns out, she's the host of the San Francisco Bay Area's ABC show "The Green Report," and it's obvious that her own TV & online video based green meme is inseparable from the broader discussion about all things eco-friendly related. Assuming the current conversation on green and sustainability continues, brands will spend a small fortune cultivating relationships (which they'll have to earn) with the likes of Lesley Nagy who bring credentialed authority to the "eco-friendly" discussion. The growing list of "Green blogs" will also be a major force (perhaps an ally...again if brands earn their respect) to contend with, across a host of other green meme themes -- global warming, hybrid cars, alternative fuels, fair trade -- as will the every day CGM creators, who publicly chronicle their migration to new habits, new behavior, new products, and new attitudes. Thomas Friedman just gave this important conversation a big push, but trust me, it's already well underway...and on a global scale. Let's keep listening! Ad Age Cover Story: Do Not Market? Katy barred the door- -- just her latest exercise in exerting control over marketing messages. Having clearly established her ability to bad-mouth your brand on her blog, TiVo your TV commercials, stop your phone calls and filter out your pop-ups, now-with the help of the government-she's trying to stop you getting access to her mailbox. If you subscribe to Ad Age, I've written four op-eds on related themes (Consumer Respect, Spam, Pop-Up, CGM Ethics). The links are also at the top left of this blog. Many of my ClickZ articles (see full archive) also address this theme. Building on my previous post, here's the video announcement by Governor Bill Richardson of New Mexico. What makes this one stand apart, underscoring once again the unique power video brings to the table, is that it's in Spanish. Traditional advertising consistently forces us to make choices about what "makes the 30 second cut." Now, rather than waiting for the first cycle of mainstream advertising, politicians (or marketers) can parallel process the targeting of key audiences, especially Latinos / Hispanics. For additional perspective re: Hispanic marketing, see previous ClickZ articles: Beyond Cinco De Mayo (2005), Moviemento Marketing on the Radio Dial (2006). Jeremy Pepper - Musings from POP! Brands I love. Brands I probably need to stay away from. Who's Winning the Battle Between Paid and Earned Media? Do Leadership & Social Media Go Hand-in-Hand? Review of Charlene Li's Book "Open Leadership"
Loyalty is Not Enough in the Age of Consumer Control! This is a Flickr badge showing public photos from pblackshaw. Make your own badge here.